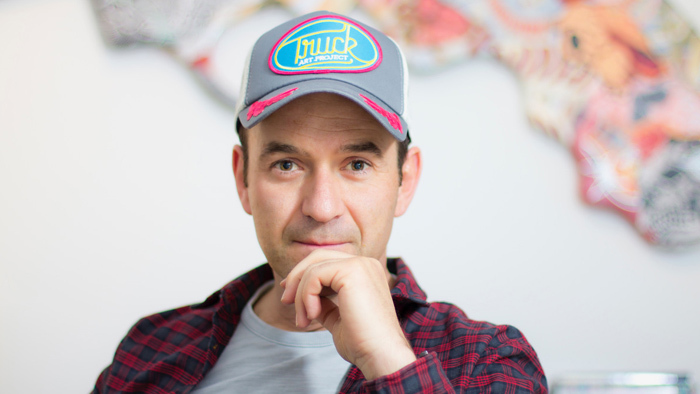 Jaime Colsa (Cantabria, 1972), the sponsor of TruckArtProject, is a Spanish entrepreneur (founder and CEO of the Palibex transport company), a collector and aficionado of contemporary art, and is drawn to different aspects of culture, from music and theater to urban creation. Conversation is easy with him because, beyond his position and responsibilities, he is an accessible man, warm in conversation. Colsa describes himself as “an active and restless subject”, which we can translate as a bold entrepreneur, although he himself has doubts and suspects that the term is too big for him when it comes to his involvement with artistic creation. And he takes pride in the fact that he does it all for non-profit: “When I was younger, my business mentality pushed me to try to get a profit out of everything I did. Now I’m 43 years old and I’ve realized that you can’t maintain the mentality of your profession in other facets of your life. I’ve discovered that my work at the company is what helps me earn a living, generate income, so that I can enjoy the other activities I participate in”. TruckArtProject is the alternative formula put into action by Colsa in order to continue “collecting” art, although through other channels, and although the entrepreneur is aware that in the end he’ll never be the owner of what he’s helping to set up now. But his own personal collection is, in his opinion, a modest one, started when he made his first purchase at only 16 years old: “It was at ARCO”, he explains, “and the price of what I bought – 12,000 pesetas back then – was the least of it, although for a kid my age it meant having to give up certain things. That screen-printing by a Czech artist that I got has a big sentimental value for me, because it was the beginning of it all, a heartbeat”. Colsa also remembers with fondness how in his evolution as a collector, his involvement with 9915 has always played a big role, as has his friendship with another Cantabrian entrepreneur, Jaime Sordo, president of this fruitful association of collectors in Spain. His collection has gone through different stages, and in the last three or four years – coinciding with the development and unfolding of his current business project –, his trajectory has grown and consolidated: “Now I spend more time in Madrid, with better connections, and with greater financial leeway to buy. My collection isn’t meant to be an investment. It comes from my personal tastes, my experiences and my own feelings. The collection mainly consists of painting, although there are examples from other disciplines. In fact, one of my most recent acquisitions is a photograph by Sonia Higuera that I got at ArteSantander”. TruckArtProject is part of the contemporary art bent of its promoter, who, in a new chapter as a patron, is demonstrating that it is possible to foster and enjoy contemporary art.